After 2 days and 8 rounds the competition ended with some surprises. Below is the updated information. Please note. I want to thank all my readers for the support you given me since I started this blog on behalf of PICA. Our blog is now listed in all the major chess blogs in Malaysia and with over 5000 hits to date, a fairly well visited site. It has been my honor and priviledge to serve Perak chess during my term as webmaster. However as a result of new guidelines from our committee, I find that I will not have the time to undertake this responsibilty any longer. And so I have to relinquish this post. I also hope that a new volunteer will step forward to bring this blog to newer heights. If you want to enquire as to the guidelines for PICA's webmaster please contact me and I will forward it to you as well as bring your name to our committee for consideration. Part of the guidelines state that there will be fair coverage of all chess activities and so I am certain you will continue to be well served. Just got back from playing classical chess at Jax Tham's place. This is the one and a half hour with 30 secs increment time control. Mark ( current MSSPK champion ) was there and he got 8th placing. He was beaten by 2 under 12 players. Considering that he played at a performance rating of over 2200 in Malaysian Open recently, giving him the best performance rating amongst even the national juniors, this result was surprising. The question we are now facing is how fast are the players in KL and Selangor improving? So coming back we sat down to relook again at our training methods and strategy. During this time I also had a discussion with Jax on the importance of classical time control tournaments. His opinion is that this is the best way to improve. The extra time allows many more ideas and subtleties to be build into one's game. And in his opinion this then improves your rapid and even your blitz games. This makes sense to me. So we are now committed to playing at Jax's first Friday tournaments. The next tournament is from the 2nd of October, the first friday of the month. The first game on friday is at 7pm, then the rest of the games on sat and sunday. So since we dont have this in Perak at the moment, I would like to encourage Perak players who want to improve to find time to take part. I have asked Jax to send me details and I will post this up when I have the information. Many focus on the technical part of chess and think it is all they need to be a chess champion. Yet in my interaction with our top national juniors, I find this is not the case. I once asked Sumant, how many games are lost for technical reasons and how many are lost by emotional reasons. The answer was more is lost by anxiety and tension. Look at this article. There is a clue there. Check out this video. Was reading Dato' Tan Chin Nam's book where he talked about the life giving energy of healthy competition. Wonder if this video has any bearing to that statement? What do you think? Selamat Hari Raya and happy viewing. On behalf of PICA, I would like to wish all muslim chess players a Selamat Hari Raya. First, the highlights from the Malaysian Open (with players from 22 countries) - 22nd to 28th Aug.
Mark Siew, our MSSPK under-18 champion did very well in this category. A late comer to the national level games, he started to show his promise in the Penang Open recently. A KL trainer even said that he will have to start following his progress in future tournaments to prepare his players against him. A compliment indeed. In this tournament, Mark defeated a 2000+ player from Russia, and two 2100+ players from China and Japan, drew with a 2100+ from China and drew with a 2200+ from Australia. He lost to three 2300's and a 2400 International Master. By our calculation he should have a FIDE rating of 2000, a good jump from 1937 when he was first rated in July. So well done, Mark. So now Perak has 2 Juniors that have a shot at the National Juniors. This will be determined at the National Juniors competition to select the national junior squad in December. 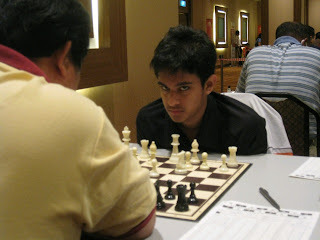 The other player is Sumant Subramaniam who is born in Perak and has opted to play for the silver state. Sumant is a current National Junior. So things are looking up for Perak. We have never been this close for years. And this year, PICA has agreed to sponsor this event. Merdeka Team Event - 29th to 31st Aug.
Our Juniors came close to winning the U16 prize but were thrashed by the Indonesian Dream girls team at the last round. Only Sumant managed to get a half point. But all in all they did very well as they fought the top international teams towards the end. Sumant displayed remarkable stamina as both Mark and him just finished the Open and played the team the next day. Still this has been Perak's strongest Junior team with the 2 Fong brothers playing 3rd and 4th board. The Fongs were former Selangor players but are now residing and schooling in Perak. All in all the boys fought well. On the 8th round, Sumant came close to beating a Grand Master on Board 1, but lost on time. He and the others have done the state proud. As for our other "Team", we got 3 Perak senior players who arrived for the Open but being short of one state player, they brought in Fadli from Selangor and now couldn't play for the state according to the rules. We even had a sponsor for the RM 300 fees but the sponsor would only sponsor the state team so they ended up financing themselves. Still they sportingly named their team the Ipoh Limau Bali team, so Perak got a mention at least. This team did fairly well considering the field. But on the second day 2 players were a no show because they had nowhere to stay the night before and so they arrived late after spending the night in UIA and got caught in a jam travelling by taxi. So 2 points were lost just like that. I hope that future organisers of our state teams will do a little extra to ensure our players are accorded more dignity and consideration. Sadly we also did not send an under 12 team this year even though we had made the allocations in the committee. We need to focus on this age group as they will be our future going forward. Education and training and selection committee. I'm reporting from the Malaysian Open. We have 3 players here from Perak flying the flag. Currently PICA is unable to sponsor events like this as they are too expensive, so these players have come up with their own money to play for the State. But there may be a little light at the end of the tunnel. Datuk Tan Chin Nam had a chat with me and asked me about Perak. He says he will consider sponsoring us if I can come up with a proposal. Our Juniors are doing well in the Open. This is a very high level competition with even titled players having only half point at game 4. Sumant currently has 2 points and Mark 2 1/2. We will be in round 7 tomorrow. So with 3 more rounds, anything can happen. Btw, for you chess followers, Sumant (National Junior) is now playing for Perak in all tournaments except MSSM. So Sumant, welcome to the Perak team. From the last information I have, PICA is sponsoring a U16 team for the merdeka team event which starts on the 29th. The open ends on the 28th. So good luck guys. If any of you want to follow their exploits, go to gilachess on the right hand side of this blog. Both events will be extensively covered there. Btw gilachess is also owned by a Perakian, Andrew Ooi. Phew, Syuen is finally over. As the organising chairman of the event, there were many times the event appeared in trouble. Potential sponsors pulled out and finally after a long search Tenby came to the rescue. Syuen was firmly behind us all the way. For that, I would like to give them my heartfelt thanks on behalf of PICA. In the final week of the event, JPN issued a directive that all gatherings were to be aborted. As a result, from my feedback, we lost 3 busload of players. So the last few days were spent calling friends personally to invite them to attend. Still the event was a success, arbiters from JPN came in to help in their own capacity. My heartfelt thanks to them too. We achieved a number of 119, slightly ahead of our other national rated event in Batu Gajah (106). So to date this is the new committee's largest event. We also received many compliments for a well run event with many asking, when will be our next event in Perak! Kudos to the committee members who helped out despite the H1N1 scare as well as volunteers from St Michael. So Perak still has a way to go before we can compete in the National level. 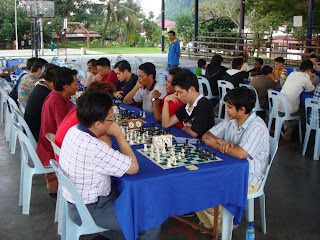 Nevertheless the much fewer diehard chess players in Perak still turned up. But to me, it's an excellent start. And finally I also want to acknowledge our chess blogging community, many of whom went the extra mile for us. We couldn't have done this without your help. Do check out their sites to see the explosion in chess throughout Malaysia. Their links are at the panel on the right. PICA is pleased to announce that we will sponsor 3 state teams to the Merdeka Team Tournament (under the following conditions) from the 28th to 31st August in Mid Valley KL. The top 4 Perak players in the OPEN will be sponsored the entrance fee to the tournament. All other expenses and accommodation will be borne by the players. An Under-16 team will also be sponsored, but the team selection and criteria will be determined by the selection committee of PICA. For the Under-12 category, the top 6 players (boy or girl) will be eligible to represent Perak subject to a play-off with the top district players. Only the top 4 in this play-off will represent Perak. For this team, PICA will pay for the entrance fee and accommodation. PICA will also pay an allowance for an official to accompany this team. All other expenses to be borne by the players. I have purchased masks for all participants that will be distributed free on the day. I hope all of you will have an enjoyable day with us at Syuen. Attention all Perak players. 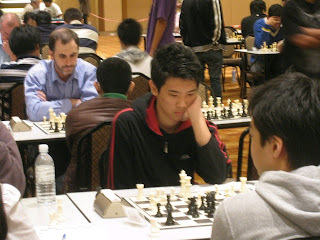 It is very likely that Syuen will also double up as selection to the Merdeka Team tournament. We are having a committee meeting at 5pm today, to determine the criteria. So stay posted and check on this blog tonight. I have had a few enquiries about accommodation in Ipoh for the Syuen grand prix. Well, Syuen is full for the 15th, I'm informed, as Maybank has booked all the rooms. A good place to stay that is within walking distance from Syuen is Ipoh's latest hotel, the Tower Regency. Superior room goes at RM150++. Their phone is 05 208 6888 and Fax is 05 253 6888. Hope you all have a nice stay in Ipoh and a good day of chess on the 16th. Thought you may like to see my new article in the Ipoh Echo. For PICA to achieve its goal, we will need sponsors to run our programs. A little secret, we do not make money from tournaments. Sometimes there is a little surplus after expenses but that will be quickly used up for other programs. We are trying to get Perak back to the National Level. So if you or anyone you know can help out drop me a line. BTW, we have now found a way to run the Syuen tournament - but we are hoping that someone can come in at the last minute to increase the prize money (especially for the Under-15 and Under-12 categories). This is our latest tournament. We are hoping that this will be our biggest tournament to date. To achieve this we are working with our joint venture partners JPN. So this is a PICA/ Unit Sukan tournament. 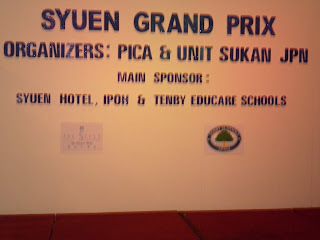 Our main sponsors are Tenby Educare Schools and Syuen Hotel Ipoh. So do come and support us as well as enjoy a day of chess. To ensure we have a timely event, please register your names with us early. Early payment and registration can also be made via email. See details on link below. Please do this as we are expecting guests from out of state. Our first prize for Open category is RM1000 sponsored by Tenby Educare Schools. 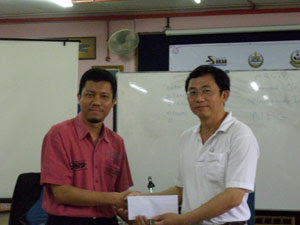 Another successful chess event in Perak. PICA played a role in managing the U12 and U15 event. I understand that the Open event may be sent for national rating. I am glad to hear that. It is important that our boys and girls get themselves national rated so they have a slight edge in national tournaments. Every little thing counts if we are to get our players back to the national arena. It's been too long since we have a Perakian in the national squad. This is the first time I have met Ong Min Junn. He is from ACS. Well done for 3rd placing. Hope to see more of you in other chess events. Here are the results for the OPEN (69 players - winners are top 10). For Perak, I am happy to see Fazil Nayan fighting strong and coming in 5th placing. Azizul Hakim, Limau Bali stalwart came in 6th. Then we have our Perak coach for MSSM Jamal Husni in 7th place. Perak senior player, Ahmad Mudzaffar, just got pipped from top 10 placing coming in 11th. And strong Limau Bali presence from 12th to 16th placing. Looks like Limau Bali is a good place to practice chess. Our boys and girls are back. I am told Perak had one of the biggest contingent there. And we did credibly well for our first busload venture out of State apart from MSSM. Here are our results. For more detailed results please go to gilachess on the right hand side of this blog. From the results it looks like the U14 boys and girls will need a lot of work to catch up. The point is this. We are moving now but we need to move faster if we are to catch up. Chess has experienced an explosion in many of our states and they have spent a lot of time and resources to play this game well. All the same, well done to all our players that got a placing. You have done Perak proud. Chess is considered a mental sport. What this means is that it develops thinking skills. From what I call the mysteries of the 64 squares, the opening, middle and end games chess teaches tactics, positioning, timing, judgement and risk taking etc. And when it is played in a timed tournament environment it teaches thinking under pressure. But in my mind it's the other aspects of chess that deserve more recognition. For over the last 5 years that I have been involved in Perak chess, it has been my honour to see the fighting spirit of our kids. To see their fire and determination to win. To see both the joy from winning and the tears of anguish after a loss. It is from this passion that I see an opportunity and a challenge. The opportunity is for parents, chess associations and chess officials to teach our children how to compete and develop themselves at the same time. For chess can also teach the meaning of strategy. Strategy encompasses the big picture. Understanding ourselves, the type of game we like and don’t like, the type of game our opponents like and don’t like, the time frames for the execution of those strategies. Strategy encompasses every factor/variable that can affect outcome. And so there is the opportunity for the learning of goal setting, planning and the discipline of training. For without the passion, these are difficult skills to impart. Competition and pressure also exposes the effects of negative thinking and the accompanying strong emotions. And so there is the opportunity to teach our kids on how to rise up again from their defeats, to set more realistic goals, to plan better, to train harder for the next time. And the challenge? The challenge will be to keep that fighting spirit alive through the adversity. To keep that light in their eyes. Our challenge is to guide our kids till they are ready to handle the world on their own as they must someday. For if the lessons are well learned our kids will now have the tools to set and attain whatever goals they give themselves later in life. For me this is complimentary to academic achievements. There is another chess tournament in Perak for this month. This is on the 25th July at UTP. Here's to more tournaments in Perak. Please note that the Sungai Siput tournament as announced in PICA's calender is now NOT a PICA event. PICA's committee apologises for any confusion. Our next event is now Syuen's grand prix. PICA's up and coming big guns have now aimed their sights on this event and we are working hard to make this the biggest and best PICA event yet in Perak. Penang has said that they will support with one busload of players. Zuraidah from KL is also arranging for KL players to come to this event. So Shafruddin of Selangor please expect a call from me soon. Azhar and all our other friends out there, you'll also be hearing from me. We hope you will all lend us your support to make this a memorable chess day. Do look out for details coming soon. It's on the 16th of August. Please block off this date for a day in Perak. ps: If you sign up as a follower you'll be notified as soon as there is a post. A friendly reminder. I am very appreciative of PICA AJK Zaki's effort to bring a junior tournament to Perak. The age range is from standard one. So I hope you will all support this. In the more advanced chess states the players enter the tournament circuit from the age of 5. 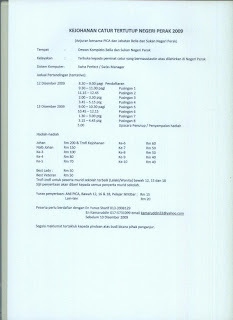 In Perak the normal entry age is around 11 or 12 for MSSM. So if you think about it. Our boys and girls will meet 7 to 8 years battle hardened veterans when they first meet on the MSSM field in the same age group. Not a level playing field. So do tell your friends, younger siblings and teachers. This is one event we really need in Perak. 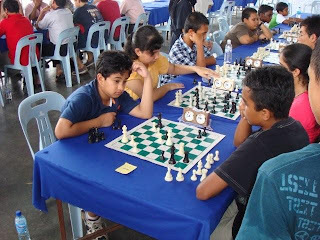 Look for details in my earlier post - Ipoh Junior Chess Tournament. It is conducted by Insofar Chess Academy on the 5th of July. Good luck Zaki, I wish your tournament every success. Looks like I'm going to have to find the manual for the camera. For those of you with exceptional eyesight. This is the group photo with the winners and our AJK's. We just completed our event at clearwater. There were a few minor hiccups but all in all the event was fairly well run with our new president chipping in. Our apologies to Encik Azhar from Selangor for the confusion over the rating. The AJK responsible for the event was not present in our exco meeting where we decided that we were going to use National ratings for our events. We will have to improve our internal communication and procedures. We hope that all in all you and your family had a good time in Perak. In this event we had good support from friends coming in from Selangor and KL (and of course our strong supporter the Subramaniam family from Camerons). A strong field was present for this event. National Senior player, Che Hassan, National juniors, Nabil, Shakir and Sumant. KL player, Jian Wen came with his parents. We also had strong enthusiasts, Dr Paul, his nephew and Shiva coming all the way from KL. A special mention also for Nabilah and Najiha our national juniors who both brought back golds from Vietnam in the recent Asean games for the under10 and under12 categories. Congratulations! And thank you all and every one else I didn't get to mention for coming. We had 71 players in all and I am glad to see there are a few Perak players in the top 10 for the Open category. Here are the results. I have indicated Perak players by the side of their names. So you guys, work harder. Zaki, our apologies for the mix up over your prize. I am a little confused about the results. My apologies. Just came back from Penang Open. Perak was represented by one player Mark Siew. Click here: to see his results. Mark did resonably well. He defeated a strong National Junior, Yeap Eng Chiam to get 13th place in overall standing. In the 8th round he was on table one and met with Fide Master Mok Tze Meng who was the final winner. If Mark had won or drawn his last round he would have finished top 10. Penang was an amazing experience. From what I can see they are able to hold a FIDE event just from players in the state. I spoke to their President Mr Lee Ewe Ghee who said they would be happy to find ways to work together with PICA. He also said that they are very supportive of PICA events and have come in force for our past events. He then introduced me to their Secretary, Tan Eng Seong who said that they can send a bus load of players to our events if we can coordinate with them beforehand. I told him I will look into ways to increase coordination with him. Perak now has 3 players active in the FIDE route and we hope to find sponsors to increase these numbers. Eng Seong also told me that Penang chess association sends about a bus load of players to tournaments nearly every week and send 2 bus loads for bigger national events. I felt a little embarassed that Perak has sent only one player but I think he did make a little impact. I hope that very soon Perak too will be able send our players by the busload. 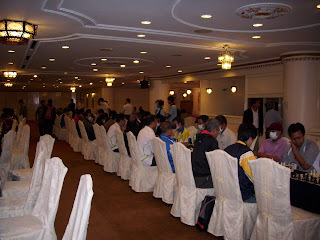 Persatuan Kebudayaan India Bercham Open brought another chess event to Ipoh. The tournament portion was conducted with PICA volunteers. Old hand, Yunus, with two newbies, Khatib and myself managed to run the event with minimal hiccups. After this first tournament the organisers want to make it a yearly affair. We only had 34 participants in all but the Limau Bali boys came in full force to support. The Subramaniams from Cameron Highland also came to support. My sincere thanks to them. Many of the bystanders commented that they would have joined if they had known about it. Officials from other organisations who were present commented that they too will back future projects in chess and made many suggestions on how they can help in the future. One more small step. 1. Registration by phone ONLY. Call Insofar Chess Academy 017 528 6927 for details. 2. NO registration will be accepted on the day of tournament. 3. Bring own chess set. We are back and this is the result. Fadzil was a child prodigy of Perak and last year's Perak Close champion, this is his second National Close (the last being in 2005). Lawrence was our under-18 champion and it's his first National Close. Mark Siew is the current under-18 champion, former under-12 champion and has played for the state for 5 years continuously making him the most senior Perak player, and this is his first National Close. Mat Zaki has played in the National Close almost yearly and this is the first time he has been sponsored by the state association. Munirah is our current under-18 MSSM (national) champion and this is her first National Close. Putri plays for Perak and this is her first National Close. When I sent Mark to the National Age Group this year, he and Azam (another state player) were the only Perak representatives. At the National Junior (Dec last year), Mark was the only player from Perak. At the KL Open there was only Mark and Mat Zaki to carry the Perak flag. And they were all self-sponsored. I was asked a lot of questions. What is happening in Perak? Penang is arriving by the bus loads etc etc. We were conspicous by our absence. At FIDE rated tournaments, I see only Mat Zaki and Mark. And recently, Fadzil has been coming. At the Selangor Open he told me he wants to get his FIDE rating. And this boy has been our star from standard 3. What a waste. So the education and training committee decided that we will try our best to support any Perak player that actively pursues the FIDE route for that shows a commitment to continuous improvement and FIDE events are expensive. Perak needs more than 3 players to carry the flag. But this is a start. This year, the new committee sent 6 players to the National Close (a FIDE event). We hope they will benefit from the exposure and come back to share with their Juniors. I am proud of our team's achievements. Although they started late in the day, and badly outgunned, they fought like lions and lionesses. With that spirit we can achieve anything we set ourselves. So come on the rest of you senior players, go out there and compete. Next year's National Close will carry a prize of RM4,000. But money isnt everything. I would like to see a Perakian National Master again in the near future. That honour is worth something too. Just got back from National Close with our Perak team so had to miss the Batu Gajah event. From the reports I have received so far, it was a success. I am pleased that we have one Perakian on the top 10 winners list in the open category. Syamil got 5th place in a field that brought many strong national level players. 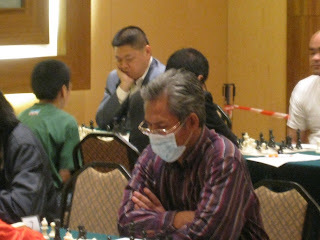 Syamil has been a long time chess player for Perak but has dropped off for a while. Still sharp after all this time. So Congratulations SYAMIL!! I hope you will now pursue the FIDE route. I don't want to repeat what Arshad has done in the terengannu blog. So go to that link to get a full report on this event. It's on the right hand side of this blog. Look for Terengganu Chess Association. Thanks Arshad. The results can also be found in gilachess. Will post on our men and womens team in the National Close later. Do add yourself as a follower so you can be notified when there is a new post so as not to miss out. Some of you have written in and asked for a place to play informal chess. Well we have one special place in Ipoh where chess enthusiasts meet for their daily dose of chess and tea tarik from about 5.30pm onwards. There you will find players of many skill levels, including former and current state players. 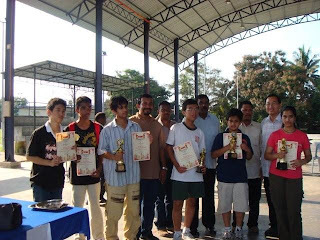 That used to be about the only place to practise chess during the dark days when there were very very few tournaments in Perak. So go along when you get the chess itch. All are welcome. Hi everyone, there's going to be another competition in Bercham on the 7th of June sponsored and organised by the Persatuan Kebudayaan India Bercham. It will be divided into 3 categories: Open, Under 16 and Under 12. Our AJK's, En. Kamaruddin & En. Kumar, have jointly organized this historical event: our first national rated event! Pssst..... Prize money for Open is RM 1,000. All prize money kindly sponsored by Pusat Tuisyen IKTIBAR! PICA's new president for development, Chan Swee Loon (NM) - paying off the man. If there was music in this blog, I would pipe in "Hail to the Chief". Thank you Ustaz Rahman from Chess enthusiasts in Perak. But as they say in chess, a winning position does not mean a win!!! As Tun Mahathir said recently over the Perak political fiasco, "people easily forget" So it's not over till the fat lady sings. Lets remain watchful and vigilent. Members included, exercise your voice. PICA is an NGO for the state of Perak, not a private club for the priviledged, selfish and jaded. Hold the new committee accountable. The new committee of PICA would like to announce our list of events for the year. The list is tentative and subject to change. Please write in to raymond@emasters.info for further information. To fully use this blog please also sign up at the sign up box so that you can be sent the special mailings that will be delivered to your email box. This is a double opt-in system and you will need to go to your email box after signing up and open up the email from us to confirm that you want to receive our mailings. If you just want to follow the latest postings of events in this blog, please click on the followers tab on the right hand side and you will be sent an email informing you of the latest posting. 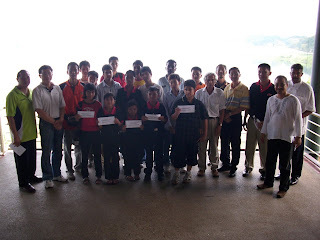 On the 15th of March 2009, a new leadership for chess emerged in Perak. After years of languishing, Perak chess found new life. Preceeding this a new PT negeri for Perak Encik Zaki Mahmood was elected. This set the stage for the people who were concerned about the state of Perak chess to come forward and change things. At the AGM the members elected a new President Chan Swee Loon ( a former National Master ) to lead the way. Here is our new line up. In our first committee meeting it was decided that PICA will attempt to work closely with MCF, Unit Sukan and all other chess bodies in Perak and to develop warm and close working relationships with them for the betterment of Perak chess. It was also brought up that this committee should be one where all members are working and contributing to Perak's chess development. There is a lot of work to be done to bring Perak chess to it's former glory. The new committee also decided to create sub committees, each authorised to undertake their areas of responsiblity. This is revolutionary for Perak as until this committee, power was concentrated in the hands of a few. With this new beginning tremendous energy has been poured into the committee and it is our aspiration that we will be able to get the necessary work done. This committe has also decided that Perakians will now be supported to all recognised National events and we have added the National Age Group and the National Juniors to our calender. From now on all Perak chess players will have the chance to pit for National Honors. The National Juniors are till age 20. National age group starts at under 8, under 10, under 12, under14 and under16. Prior to this Perakians only enter the system from under 12, therefore finding themselves out gunned and out experienced by their counter parts. AJK Zaki Yeop has a program for players from 5 to 12 years old and we hope there are more events for this age group in Perak. And no more will people leave chess after under 18 with the National Juniors. A FIDE route will also assist our older players that still want to progress. Thus contributing back to Perak's pool of expertise. We will also be arranging for courses for coaches, arbiters etc. to bring us up to scratch. Until our recent events we had no arbiters who could do swiss manager, a pre-requisite for national events, no qualified coaches in Perak. People just struggled along on their own with barely any state support, if any. The new committee intends to change this with the support of all who love chess in Perak. We are also holding more tournaments in Perak with supporting organisers.